Prague Castle is a medieval castle, the largest castle complex in the world. 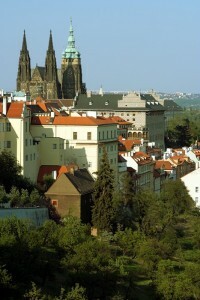 The first castle was built on the site of the current Prague Castle in 870 by Prince Bořivoj of the Přemyslids – the founding dynasty of Bohemia. You can still see the stone remains of the Church of the Virgin Mary, built at that time, in the Prague Castle Picture Gallery. If you’re interested in the details of the archaeological activity around the Prague Castle. You can see remnants of every style of architecture used in the construction of Prague Castle from the 9th century until the 20th, from the Church of the Virgin Mary of the 870s to the New Royal Palace and gardens of the 1930s. The Castle is the centre of Czech political life. Bohemia reached her zenith in 1355 when one of her greatest Kings, Charles IV, was created Holy Roman Emperor, whereupon he moved to the Castle and made Bohemia the capital of the Empire. Later, during the Hussite Wars, when the people rose up against the Catholic Royalty, protesting by throwing town councillors out the window and killing them (the first Defenestration of Prague) the Castle was left uninhabited. In 1485 the Castle was occupied once more and its defences strengthened. However, at the start of the Renaissance, the Bohemian kings filled in the moats and built pleasure palaces and gardens. During the Velvet Revolution, the Czechs shouted the slogan “Dubček to the Castle” in support of the leader who had tried to protect them under the Communist regime and who had been deposed by the Russians in 1968. It is now the seat of the Czech presidents.